To mark the 100 year anniversary of some women getting the vote, we have had a very special walking tour meeting; this also gave us a chance to enjoy the sunny weather. We had a very pleasant walk around the central London Suffragette sites. 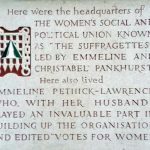 We saw the outside of their headquarters in Holborn and the site of the Endell Street Military Hospital which was run by Suffragette members, as well as many other sites. An interesting observation that we made is that window smashing is apparently much harder than you might think, the Suffragettes had evening classes in order to learn how to do it effectively! Headquarters Plaque. Image by Rebecca. 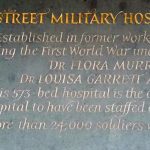 Endell Street Military Hospital Plaque. Image by Rebecca. 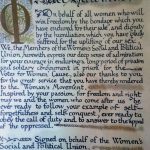 Certificate given to Suffragettes upon release from prison. Designed and had written by Sylvia Pankhurst. Image by Rebecca.